I love ramen. Those near and dear to me are fully aware of this. I was the chick in college microwaving the non-microwavable Maruchan Instant Lunch cup before class in the dorm room. I was the roommate with the constantly-replenished case of ramen packages that became my go-to drunk food. And nowadays, I get really crazy and poach an egg in the broth because, well, why not? 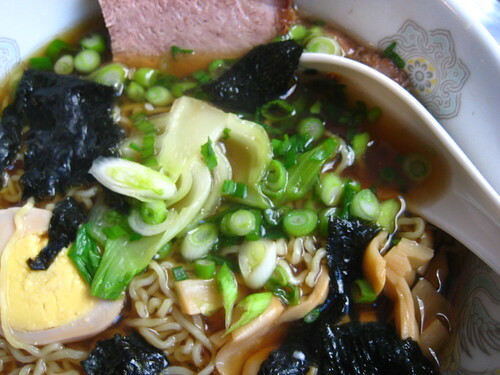 But of course, ramen isn't the blogworthiest food out there. 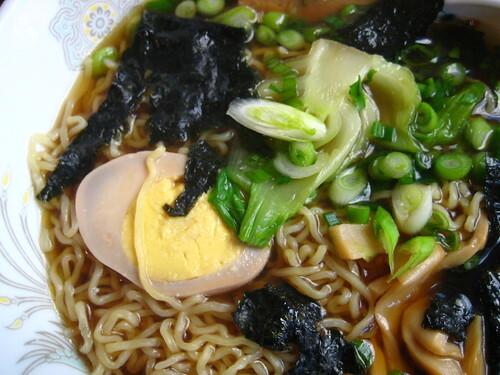 And I'll be completely honest with you: I've been a little ashamed to post a picture of the ramen-and-egg creations that I eat for breakfast at least once a week. I just want you guys to like me. But it's time you knew the truth. I ate this ramen for lunch one day at Macy's Seven on State (where I also ate this juicy burger). And since it was served to the public and not dumped out of a square package with an MSG-packet in my dark little kitchen, I figured it was acceptable to take pictures and blog away. Perhaps I've become some sort of weird ramen snob (after all, I do draw the line at the cheaper, lesser-quality Top Ramen and only eat the Maruchan brand), but I really didn't like this ramen at all. Really. After several bites, I decided I'd rather be eating Maruchan. I ordered the Shoyu noodles with braised pork, seaweed, green onions, an egg, bamboo shoots, and baby bok choy. I was excited about the egg, but then it turned out weird. And brown, but that didn't really bother me until I took a bite. The pork was soft but kind of fatty and mushy, also. The noodles clumped together at the bottom. The broth tasted funky. What a shame, because I think the pictures turned out pretty nice. I won't tell you what I paid for it, either, because then I'll be really embarrassed. But I will tell you this: if I'm ever craving ramen on my lunch break, I'm heading to Tokyo Lunch Box for their vegetable tempura udong. Waaaaay cheaper and NOT funky. 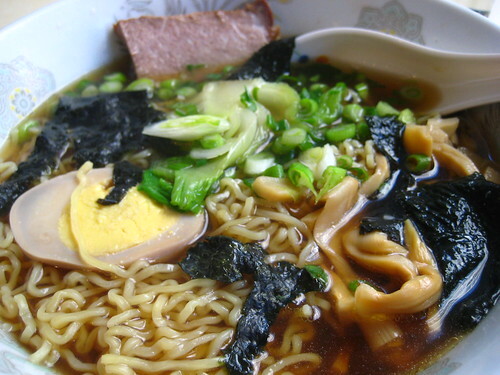 But still, nothing beats the Maruchan ramen noodle soups, Oriental flavor. Because Orientals taste the best. Mmm....I don't think I've had Maruchan before. I like the Thai Mama brand best! I love Maruchan. I've never heard of Thai Mama, though! Creamy Chicken is the best flavor. TanTan Mein is what I think is the greatest Ramen. When my brother visited last summer, we did a TanTanMein tour...but after 7 days of that...no more. But this weekend coming up, I will eat it again in Yokohama.